San Francisco has five hotels with a five-star rating. 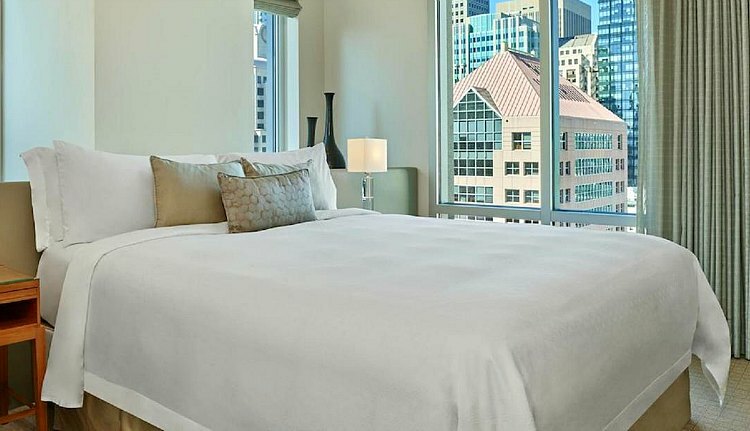 Each of these five-star hotels in San Francisco offers a high-end, luxurious experience. All have wonderful on-site bars and restaurants. They also have spacious rooms and modern amenities. To help you find the one that is right for you, below I've written about my experience with each one, some recent guest reviews for each one, and a few other things you need to think about before you book. 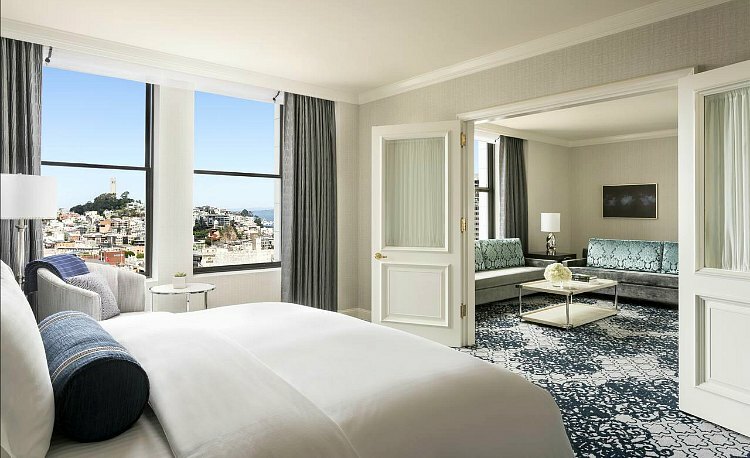 The Fairmont Heritage Place is the first of the five-star hotels in San Francisco on my list. Even though it's considered a hotel, they don't offer the standard rooms. Instead, the Fairmont Heritage Place offers 53 one-, two- and three-bedroom luxury apartments. The location for this one is fantastic. It is in the old Ghirardelli Chocolate Factory, which is now full of shops and restaurants and is called Ghirardelli Square. This is on the western side of Fisherman's Wharf. Each apartment has its own kitchen. Most rooms also offer sweeping views of the San Francisco Bay. You'll find modern amenities mixed with charming decor such as the exposed brick on many of the walls. Find additional ratings, reviews, and room availability on Booking.com. The second hotel on my list of five-star hotels in San Francisco is the St. Regis. This hotel is in the South of Market (SOMA) area of San Francisco, next door to the renowned SF Museum of Modern Art. It is close to several restaurants, shops, and galleries and it's only about a 3.5-block walk over to Union Square. The St. Regis is part of the Starwood group of hotels. It has 260 guest rooms as well as 46 suites. One of my favorite features of this one is the 50-foot infinity edge swimming pool. This indoor pool offers a relaxing atmosphere with natural lighting and comfortable chairs for lounging. Even if you don't want to go for a swim, it's a quiet and relaxing place to gather your thoughts. The overall guest rating for this lodging option is very high. Find additional reviews and room availability for your upcoming visit on Booking.com. 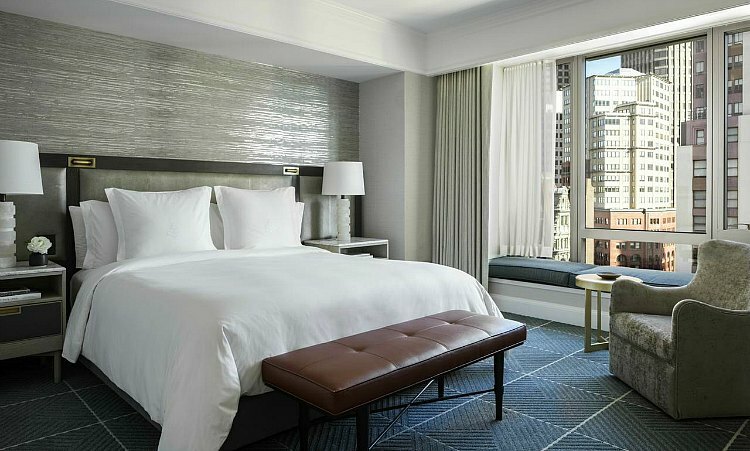 The Loews Regency is another one of the highly rated five-star hotels in San Francisco. However, it's third on my list due to its location in the Financial District. This luxury hotel is the perfect choice for business travelers. This area of town is pretty quiet at night and even more so on the weekends, whereas the other five-star hotels in San Francisco offer easy access to nightlife and more fun for those traveling for pleasure. This hotel has some amazing views, as its rooms start on the 38th floor of the building. One of the most popular room types is the Bridge to Bridge room. 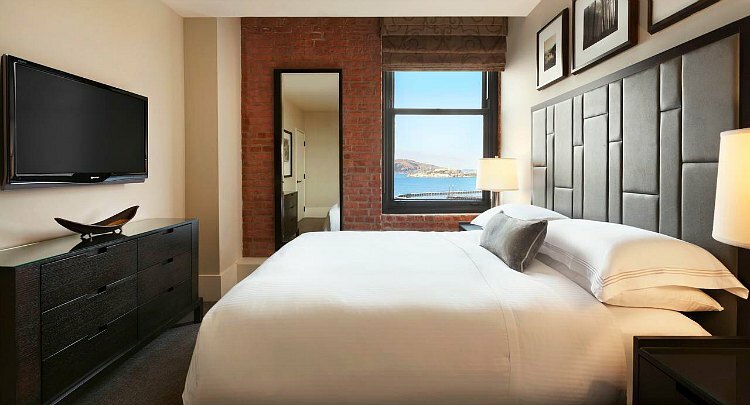 These rooms offer sweeping views of the San Francisco Bay from the Golden Gate Bridge to the west, all the way over to the Bay Bridge to the east. It's a pricier option, but worth the extra money if you want to relax in a room with a spectacular view. Find more reviews on Booking.com to see if the Loews Regency is the right hotel for your visit. The Four Seasons Hotel near Union Square is another one of the five-star hotels in San Francisco that does not disappoint. It's located in the heart of the action. Within minutes, you can walk to several wonderful shops, restaurants, and museums. In addition to the large guest rooms—many with great views of downtown San Francisco—I also love their on-site bar/restaurant and gym. Seasons, the restaurant, is a quiet retreat away from the chaos of the city. We go here quite a bit because we love the comfortable setting, the relaxed atmosphere, and the fantastic drink selection. Four Seasons guests can also use the Equinox Sports Club. I was a member here for several years and the facility is amazing. There is an Olympic-sized lap pool and two floors of cardio and weight lifting equipment. The gym also features one of my favorite spas and salons in the city. 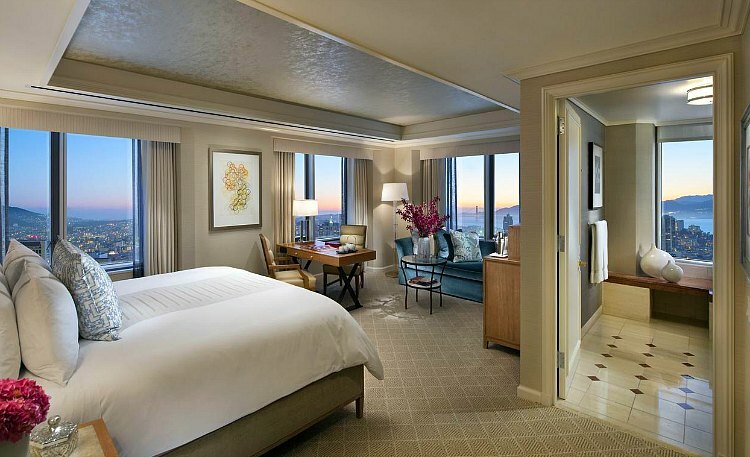 Find out more about the Four Seasons Hotel San Francisco, including guest reviews and the best rates on Booking.com. The Ritz-Carlton is the last on my list of five-star hotels in San Francisco. It's also one of the least expensive on the list. I love this hotel for a number of reasons. It's in an amazing area called the Nob Hill neighborhood. It sits on a classic, steep, San Francisco hill, which gives you a great feel for the city. When you pull up to this hotel, you feel like you are pulling up to a mansion. The exterior is high-end all the way. The lobby and bar area are also modern and classy. Many guests rate it highly. Find more reviews and the most competitive nightly rates on Booking.com.